What's in it? Fresh fruit preserve, flour, little sugar, unsalted butter, cold milk and dusting of powdered sugar. Suggested Pairing: A cold glass of milk. 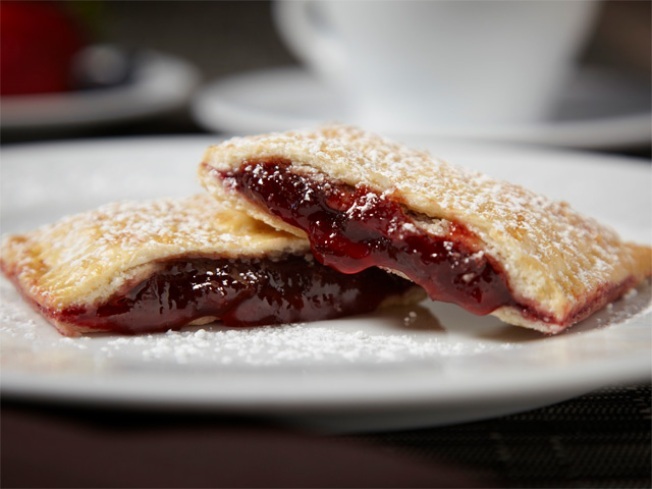 Executive Chef Kristine Subido says: "Growing up I was never allowed to have Pop-Tarts. My friends used to eat them on the way to school and that was the only way I could taste it. There was a good reason why my mom didn't let us have them -- too sweet! This is my little way of having pop tarts without feeling guilty. Fresh, honest ingredients make all the difference." What is Times Square missing? Why, a Pop-Tart cafe, of course! "Pop-Tarts World" opens Tuesday, August 10, joining M&Ms and Hershey as yet another sugary tourist attraction in Times Square. Located on 42nd Street between 6th and Broadway, the store will run at least until January, when company executives will decide whether to continue it. The store will include a cafe selling...you guessed it, Pop-Tarts. But promoters have promised a few surprises. "People say 'Well, what can you really do with a Pop-Tart?'" chief operating officer Scott Schoessel of Gigunda Group told the New York Times. "Our chef has come up with amazing concoctions." Among them, "Pop Tarts sushi," minced Pop-Tarts wrapped in a fruit roll-up. The cafe will serve 30 different snacks and desserts, reports the Times. Impressive, when Pop-Tarts only come in 28 different flavors. Visitors can also design their own Pop-Tarts by adding frosting, toppings, and drizzle. In fact, just about the only attraction at Pop-Tarts World which won't put five pounds on you is an hourly light show. The intent is for visitors to feel like they're being 'frosted' by red and white light, then 'sprinkled' by brief pulses of multicolored lights, and then 'wrapped in foil' by one last bright light. Kellogg, Pop-Tart's parent company, hopes the new location will "project an image of growth and maturity," Richard Demb, former owner of Times Square's Dale and Thomas Popcorn, opined to the Times. "Our long-term hope is to strengthen the bond between the brand and the consumer, and that has great benefits for the brand," senior director of Pop-Tarts Etienne Patout told the Times.